I came across this lecture by Srila Prabhupada’s early disciple Yamuna Devi. It is so wonderful that I thought make it this month’s newsletter. (Plus, I am writing a book to go with a new preaching program I am developing and need to focus my writing time on this project). I trust this will both inspire and help you as much as it helped me. Radhanath Maharaja has requested that my god sisters and I speak something. Last night, after we left the transcendental program and before I took rest, I was thinking how incongruous it was — you know, I have been a devotee for thirty-odd years, and it’s quite rare that I am asked to speak. In fact, it’s extremely unusual, so I am not practiced at it. And as I told you yesterday, I rarely spoke when Srila Prabhupada was here. He asked various disciples to speak, but I told him clearly that I wasn’t comfortable with this, and he was a little kind upon me and only on occasion he would ask me to speak. So, anyway, I’ll fumble through as best as I can. So, Maharaja gave this broad assignment of Srila Prabhupada. And I was thinking what I could speak on—because yesterday I asked, “If you please,do you have any questions in regard to Srila Prabhupada the person —something you don’t find in books that have been written, or that you can’t grasp, or that you are hungry for upon seeing him on film or hearing his disciples glorify him on tape, something I may speak on?” But nobody asked me a question, except one prabhu about five minutes ago. So, when I came this morning and sat down to japa amidst you all for the first time, again I was awestruck by your company. It was like “surround sound.” If you are ever in a recording studio — it’s a bit high tech —there are many tracks that can be recorded upon, and when you sit in the listening room and the sound comes on and the mixing is correct, you are surrounded in all directions with that sound—from the four directions: left and right, up and down. So, I felt like that. Just being in your company I was surrounded by your bhakti, your prayer, the repetition of the vibration of the maha-mantra, and again I was overcome by the quality of your association. And I spontaneously began to…in my japa I tried to focus in on what I am doing, because of all the regulative principles, the most important principle given to us was to chant sixteen rounds of japa. And I have been immersed for so many years in the offensive stage of chanting that just last year, when I was reflecting on what I wanted to change most in my spiritual life for this year, it was to try very hard to move to the clearing stage of chanting the holy name. And as I was focusing in, I remembered so many instances when I had been with Srila Prabhupada and had an exchange with him in this area of japa, and I thought I could share those pastimes with you. In so many ways they might inspire you as they inspired me. Because as I mentioned yesterday, we have this little time gap that seems to separate us so that Srila Prabhupada was with us from 1965, when he sailed on the Jaladuta and arrived in Boston Harbor and we have the history of his activities through November 14, 1977. The first incident that strikes me profoundly is something that took place in Akash Ganga, in Mumbai. I think it was 1971, and although I wasn’t stationed in Mumbai very much, on occasion Srila Prabhupada called my husband and me there for service, or sometimes for sankirtana or some function — a pandal perhaps — and on occasion to report to him on some service we were doing. This was during the morning japa period. Yesterday, when Radhanath Maharaja gave the schedule for today, he said,“Please be prompt; everyone be there at 7:30 tomorrow morning,” and he said we would chant for two hours. So similarly, in all of our temples, there is this time allotted for all of us to chant japa together. And this was at that time one morning. Then Srila Prabhupada walked in from his bedroom and got on his vyasasana. He didn’t say a word; he was just looking at us chanting our japa. I immediately became aware of his presence. We all paid our respectful obeisances to him, and rather than immersing himself, he became intently focused on each and every one of us in the room. Other than on this occasion, I have never experienced that anywhere to such a degree. It became very profound. You’ve heard some devotees say that when Srila Prabhupada looked at you he saw you and he saw through you and he saw the past, present, and future — he just saw so much. So, during that japa period he was looking very intensely at each disciple, and something very, very transcendental happened. All of a sudden, the men who were walking around in circle sat down. And all of a sudden, devotees started to sit up very straight. Right now people are in various stages of leaning over, but there is something very powerful about sitting with one’s back nice and straight, the shoulders back . . . Just do it; you’ll feel what it is like. Right now—just sit up very straight, lift your head up, look ahead, and imagine yourself in great attention chanting japa in this way, all together. I felt as if we were a big lotus flower and Srila Prabhupada was in the whorl of the lotus flower, the center, and we were all these petals opening up around him in transcendental sound, and from Srila Prabhupada’s presence, the quality of the japa changed dramatically, without one word said. So that’s one big instruction, which you can take as you wish. I have taken it a little seriously in my life. If I focus on my rounds first, in the brahma-muhurta hour without doing anything else — if I don’t write lists — then my day is different than if I do otherwise. Actually, I do build a fire in our wood stove at home because in our ashram we don’t have electricity or heaters — we have a wood stove that supplies the heat, so we start the wood stove in the morning beforehand, but other than that, we get up and chant and only chant. Another occasion that was very moving was in Indore, in December of ’71, at a pandal program, I believe at Gita Bhavan. The living quarters given to Srila Prabhupada were very pleasant. It was a large piece of land — about this size, maybe a little larger — and there was an outer perimeter wall with small kutiras. There were sadhus there, and activities were going on, and in one corner of the land there was a little hut with a fire in it, and a large iron cauldron and water that had been heated the night before. When one wanted to take a bath, he went into that hut and got a few lotas full of nice warm water and mixed it into the cold so that the water was warm enough to bathe with. And Srila Prabhupada had one small room in that facility. There was also a hall, and rather than staying in his room, Srila Prabhupada would go into the hall to chant and do translation. I was always a little hungry to experience Srila Prabhupada’s company, and in those days, perhaps it was youth, I was a little bold. Not as bold as Malati was, but all of us were so hungry to taste Srila Prabhupada’s company that we would try to slide in wherever we could to achieve that. So I found that Srila Prabhupada would chant and do his translation work in the hall in the morning. And one morning I got up at one o’clock, and I took my bead bag and Teachings of Lord Caitanya, which I was reading at the time, and really quite like a mouse, I slunk in through the back entrance and huddled in a little corner praying that Srila Prabhupadawouldn’t see me, that I would be able to stay in that space (there was nobody else in the room). The impact of that was, again, tremendous. I was very hungry for this kind of association. Even at that time I understood that I was in this dark well of nescience and that a lifeline was being dropped down, one of the lifelines . . . No, I actually considered *the* lifeline to be this japa. And yet I have been so offensive to it over the years—as I say, in this offensive stage—but I know its importance. As Srila Prabhupada lived with us and we lived with him, there were practically no closed doors, even when Srila Prabhupada took rest. During this period in India, he gave us access to him more or less twenty-four hours a day. This had not necessarily been so in the early phase I discussed yesterday—the *adi* phase, from 1966 through 1969. That had been very intimate, and Srila Prabhupada had taken personal care with each and every one of his disciples, because it was a small-enough family for him to do that. But in this phase in India, this *madhyama* period, for the first time, those of us who were with Srila Prabhupada got to see him in action in a way that we hadn’t seen him in the West—he engineered everything. We had no idea how to function in India, and Srila Prabhupada was so comfortable in all different levels of that society. He knew how to reciprocate with the most sophisticated man and with the most simple. He knew how to associate with both the most learned men and the greatest of fools. And similarly, with his disciples, he was able to penetrate the heart of the disciple and reciprocate with that. So this japa was for me something I was very hungry for—especially to associate with Srila Prabhupada during the brahma-muhurta; I was very attracted to that. Another transcendentally surcharged moment for me was later—all the way into Vrndavana. It was my second time in Vrndavana, in November of 1971, after the first Delhi pandal, and for the first time in India I was quite indisposed. Just as the pandal program was beginning and the first aratiwas performed for Their Lordships, I went into some kind of a fainting spell, and I didn’t wake up for two days or so. It turned out that I had jaundice, and that’s another beautiful side story — how Srila Prabhupada personally took care of me during that period. At the end of the pandal program, Srila Prabhupada took us all to Vrndavana together, and we were staying at the crossroads of what was then called Chattikara Road, which is now Bhaktivedanta Marg, and the town of Vrndavana, at a place called Saraf Bhavan. During our time in Delhi, Srila Prabhupada had said that some of us would stay in Radha-Damodara Temple. He took Syamasundara with him, and Gurudas, and maybe a third man — I’m not sure if somebody else leaped on that. The minute I heard they were going, I thought “I want to go with them”. 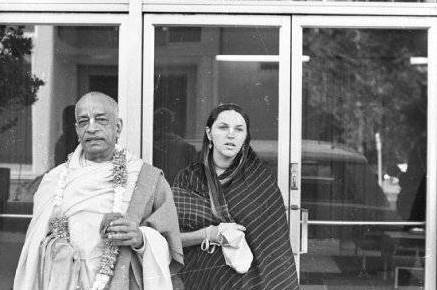 I am such a greedy person, and I had a little taste because Srila Prabhupada had previously sent my husband with the keys to Radha-Damodara and said, “Go to those rooms and clean them out for me,” and no one had been in the rooms since 1967, and that was only briefly. Before Srila Prabhupada had left for the West, he had lived in two rooms in the Radha-Damodara Mandira complex—an incredibly glorious story—and those rooms were the epitome of simplicity and renunciation. One had a sense of tapasya and all the things one might assume a great transcendental personality would possess or live in—very simple, so simple: that little asana that he wrote on was a piece of weathered wood that looked like it had been floating in the sea for twenty years. It was all cracked, practically falling apart. As you may know, in 1967 Srila Prabhupada had a heart attack that almost took his life and he went back to India to recuperate. He took two brahmacaris with him, and one followed later — Ramanuja and Acuytananda, then Kirtanananda. So, Srila Prabhupada stayed in Radha-Damodara for a little time, then he allowed Acuytananda and Ramanuja to stay in those rooms for a little while, and since then no one had been in them until he sent the keys. When Srila Prabhupada sent us to clean the rooms, immediately that tirtha became very profound in the consciousness of all the devotees who went there, and that was Gurudas and Bhanu and Giriraj and Gopal and me — we all went and took out bucket after bucket of this fine transcendental Vrndavana sand with sparkling silica in it, very powdery because during the *loo*, the windy season, it would come through the little wooden shutters, which had big holes in them. There was about two and a half inches of dust, so we all wrapped ourselves up and took out the dust. It was like going on a transcendental mining expedition—to try to find Srila Prabhupada under all this Vrndavana element. When I got there, the front gate was closed, and I remember pushing it open centimeter by centimeter so that it wouldn’t make any noise and Prabhupada wouldn’t hear me. When I got into the courtyard, I noticed that the light was on in Srila Prabhupada’s room, so I was quiet, no japa — I mean my lips were moving, but no sound was coming out. I chanted like that for what couldn’t have been more than three minutes, and all of a sudden both of Srila Prabhupada’s two doors (he had two doors to his room) were pulled open and he appeared and said, “Yamuna, come here.” I thought, “Oh my God! How does he know I am here?” I was stunned. So I came up into the little pool of light from the one light bulb in his room, which was coming through the doorway, and paid my obeisances there. “How did you get here?” he asked. “I walked.” “You should never have done this,” he told me. “Vrndavana is very dangerous place at night. There are many dacoits here. And if they see just a little sliver of a copper lota, they could cut you, just for the lota.” I said, “I didn’t know.” “Never mind,” he said. “You have come; you can chant.” So I sat just outside of Srila Prabhupada’s room, and he was walking back and forth in his room, both of us chanting japa. I also used to sit in the courtyard and watch Srila Prabhupada—how he chanted in this very, very sacred place. Those are moments that can give a disciple incredible strength, if he or she is capable of grasping the rope. And though I may happen to be the personality involved in these stories, you can apply them in your daily life to check how you are chanting your japa and how you are reciprocating with your guru. Just like when yesterday Radhanath Maharaja gave some ground rules of the Pune Yatra — he said, “No prajalpa. Be here. Take advantage of this time we have together. We can never take this second away. We can’t bring back two seconds ago or four seconds ago. We can only take full advantage of the moment that we have now in the shade of the mercy of the lotus feet of our guru’s blessings on us. That’s what I realized when I was chanting japa with Srila Prabhupada — that it was very, very important not only to try to follow the injunction, which I have been miserable at, but to do it with full attention. One other very small incident was in 1969, not in India but in a van. We were traveling from John Lennon’s estate in Tittenhurst, where we were residing at the time, to a Conway Hall lecture that Srila Prabhupada was to give in Central London, and by some amazing quirk I had the opportunity to spend much of the day in Srila Prabhupada’s service. Sometimes during that period, I didn’t get to rest until ten or eleven at night and I was up at two in the morning, bathing, waking up the little temple Deities, doing some temple service, and then going to Srila Prabhupada’s room for an arati. Srila Prabhupada was giving me and Purusottoma dasa, his brahmacari secretary at the time, our earliest instructions in approaching the arca-vigraha; it was a very special period. So I was really tired most of the time, because I slept only three hours a night, and I always wanted to ride in that van with Srila Prabhupada as much as possible. One day, I was sitting behind Srila Prabhupada with my back to the back of his seat, chanting japa. And Srila Prabhupada, very matter-of-factly said, “You sang the words wrong.” So I got up on my knees and leaned over the seat right behind his and asked, “What words?” He said, “That record you made — the words are wrong.” “Which words are wrong?” I asked. “Bhajahu re mana,” he replied. “They are wrong?” I asked, because we didn’t have songbooks in those days, and when we had made the recording, it had been early in the morning and I had been very tired. I had been sitting in a room, just singing to myself, and hadn’t known it was being recorded. So, I was very surprised, and I said, “I am sorry; we didn’t know the words, so that one went wrong.” “Are you chanting your sixteen rounds?” Srila Prabhupada asked. “No,” I said. “I don’t have time for that.” “Can you make time?” he asked. “I don’t know where,” I said. “I don’t know how to do that.” Now, this is not to be imitated — I am just recounting the stories. “Well, for the time being,” he said, “can you chant at least for one hour a day?” “I can try to do that, Srila Prabhupada,” I replied. “Yes, at least one hour a day,” he confirmed. Just last year I had the good fortune to study two books: Prabhupada Saraswati Thakur: The Life and Precepts of Srila Bhaktisiddhanta Saraswati and Of Love and Separation, which has a series of collated letters that Srila Bhaktisiddhanta wrote to his disciples. And one section of letters was on japa, including an instruction that Srila Bhaktisiddhanta gave to one of his disciples — that he could chant at least one hour (his disciples were required to chant sixty-four rounds, instead of sixteen). So, these aren’t exciting stories in terms of humor or adventure — the adventure that Srila Prabhupada took his disciples on in Krsna consciousness — but they are really the core of how I can aspire to be a Gaudiya Vaisnava disciple of such a great personality, and that’s through the vehicle of the holy name. And really, that is true for all of us—past, present, and future.